The very name of this tiny peninsula in northern Scotland evokes fond memories and takes me back – almost physically, it seems – to the little cottage I shared with my mother and sister for one week in Summer 2006. I can recall the peculiar washer and dryer (which try as we might we never could get to work), Julia’s bedroom at the top of extremely narrow, very steep, almost ladder-like stairs, and Mom’s makeshift bedroom in the living room. I certainly recall walking outside on Chanonry Point, which is a sightseeing destination for locals and tourists alike, our tiny cottage the only structure other than the lighthouse on the point. People would gather at all hours of the day to watch the dolphins that gathered in the Moray Firth just off the point, the largest “traffic intersection” of dolphins in Scotland, perhaps the world. I also well remember the many dogs that traveled with their humans to explore the shoreline. My family has always loved dogs, and the three of us reveled in having so many of them just outside the cottage’s front door. But of all the things I remember of that week at Chanonry Point, perhaps none stands out more than Mom being immersed in a book she found in the cottage. During quiet times that week, as we’d take breaks from our exploration of the Black Isle (as it is called) and the nearby communities of Rosemarkie and Fortrose, Mom would have her nose stuck in the pages of Derek Bowman’s Tam: The Life and Death of a Dog. Mom not only loves dogs – she also loves books, and she especially loves books about dogs. All week, she kept telling Julia and me how thoroughly she was enjoying the book. 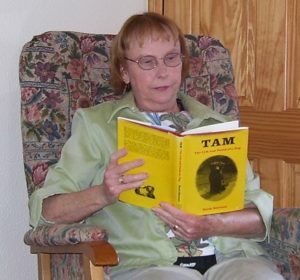 The volume became such a part of our time at Chanonry Point that we have a photo of Mom reading Tam! Years later, Julia and Mom tracked down used copies of Tam, and now all the women of the family have their own copies. When I finally took time to read my copy of Tam, I immediately understood what all the fuss was about. Bowman brings Tam to life in such a vivid way and perfectly describes a dog’s ways of being and habits, its gestures and quirks. Flash forward to 2017. I decided I wanted to feature Tam on StoryWeb, but I’d need the author’s permission to read an excerpt from the delightful book. Always one for some good cyber-sleuthing, I dug into my Google detective work and discovered that Derek Bowman had been a lecturer in German at Edinburgh University. I wrote to the department chair to see if he knew Bowman and if he knew how to contact him. The next thing I knew, I had an email from Derek Bowman’s two daughters, Catherine and Elisabeth. I felt I already knew them as Bowman – of course – makes them part of the story of his 1978 book. But now Catherine and Elisabeth were all grown up, and they were writing to let me know they’d received my request from the university. Sadly, both their father and their mother had passed away some time ago, but they would be delighted for me to feature Tam on StoryWeb and happily gave me permission to record some excerpts. They also told me more about their father, who despite my best investigations, had remained a mystery to me. Born in Liverpool in 1931, Derek Bowman loved languages and ultimately became a university lecturer in German. In addition to writing literary criticism and translating German works into English, Bowman also wrote and published poetry. His translation of The Diary of Dawid Rubinowicz is particularly interesting due to the subject matter. The diary of a young Jewish boy in Poland during World War II, the book is similar in content to Anne Frank’s diary. The story was little known at the time Derek Bowman translated it, and Bowman made a trip to Poland, then an Iron Curtain country, to verify the authenticity of his sources. Bowman also translated several short stories that were broadcast on BBC Radio, and a number of his poems were published in The Scotsman, one of Scotland’s major daily newspapers. From the book’s title, you know it does not have a happy ending. Always, sadly, we must let our doggies go, as their lives are so much shorter than ours. But oh, the love they give us while they’re here, the boundless joy we share with them! If you want your own copy of Tam, you can find a used copy on Amazon as well as other online book outlets. I know you’ll love this short, sweet book every bit as much as Mom did that week on Chanonry Point. Listen:Listen as I read an excerpt from Derek Bowman’s book Tam: The Life and Death of a Dog. Image Credit: My mother, Bonnie Burrows, reading Tam at Chanonry Point Cottage.